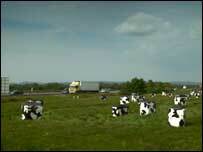 Rubbish bins painted to look like Friesian cows have appeared in a field next to the M5 in Somerset. The unusual herd is part of an initiative to encourage young people to recycle waste and to develop their own ideas for recycling campaigns. The bins will be used by schools from September to coincide with the return from summer holidays. A three-month test saw the amount recycled go up by 61% compared with ordinary bins in the same period. The bins are in a field between junctions 20 and 21, near Weston-Super-Mare. Defra's Waste Strategy for 2007 emphasises the need for a culture change to boost participation in recycling, in particular requiring the placement of more recycling bins in public places and the increase of recycling in schools. "We have found that that if you capture people's imagination and make recycling attractive and fun, they are far more likely to participate," said Dr David Gillet, of waste containment firm Taylor which is responsible for the design. At New Cross Gate, the first test site for the bins, as well as increasing recycling, the trial succeeded in eliminating incidents of fly-posting and vandalism. It also revealed that children were inspired by the idea of "Feeding the cows", and as a result calf bins have been developed for primary schools.